Perry and I had married in early 2002 with the hopes of beginning our family immediately. Unfortunately, we experienced two back to back miscarriages in 2002 and we felt the dreams of a family were slipping away from us. We decided to seek the help of a fertility specialist before moving forward. The doctor was able to determine that I had a slight blood clotting issue which was contributing to the miscarriages and felt it could be resolved successfully by taking a baby aspirin everyday. In April 2003, our prayers were answered when I became pregnant with Grace. The pregnancy was watched carefully by our doctors until the first trimester ultrasounds showed a growing and healthy baby. During the second trimester, I had several routine tests completed including an AFP, which screens for potential birth defects. It was not a mandatory test, but due to our family history with spina bifida we felt it was important for us to do this for our baby. The test was routine and we honestly were not worried about the results as we didn’t expect anything to show up. Within a week or so, I received a call from my OB|GYN explaining the test came back positive for Down Syndrome. It showed a 1:10 chance for Down Syndrome, however, only an amino would be able to confirm these results. Due to our history of miscarriages, we decided not to have the amino and instead educated ourselves on Down Syndrome and prepared our world for any special needs our baby might require. 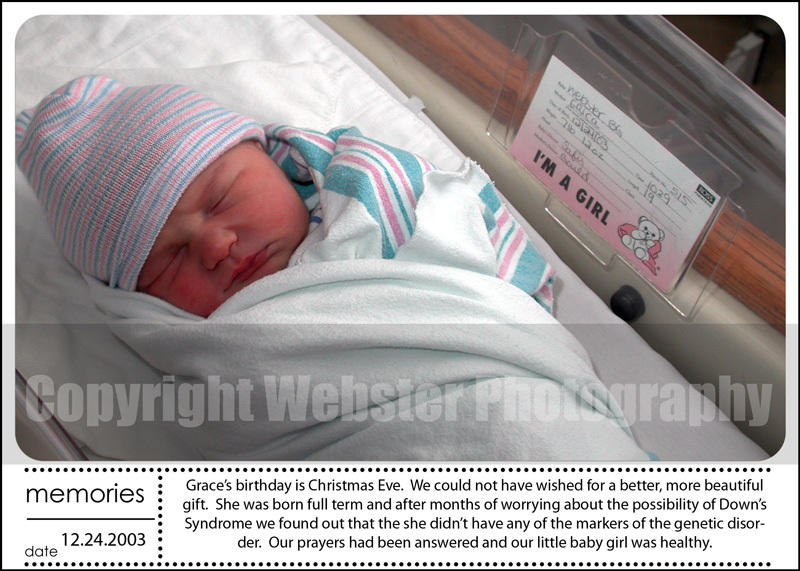 Grace Katherine Webster was born on December 24, 2003. She was absolutely angelic. Our first question after her birth was whether or not she appeared to have Down Syndrome and the doctors indicated that she did not. Grace did well the first night in the hospital and we were allowed to take our little angel home on Christmas Day. The first few weeks were difficult as Grace wasn’t gaining weight as we had hoped. We were instructed to track the ounces she was consuming and how many wet/dirty diapers she had throughout the day. It took several weeks, but things turned around and she began to put on weight. The specific trigger to the events that early morning will never be known. We only know for sure that Grace was having a seizure when we found her that early morning. She went into cardiac arrest and then catastrophic metabolic failure. 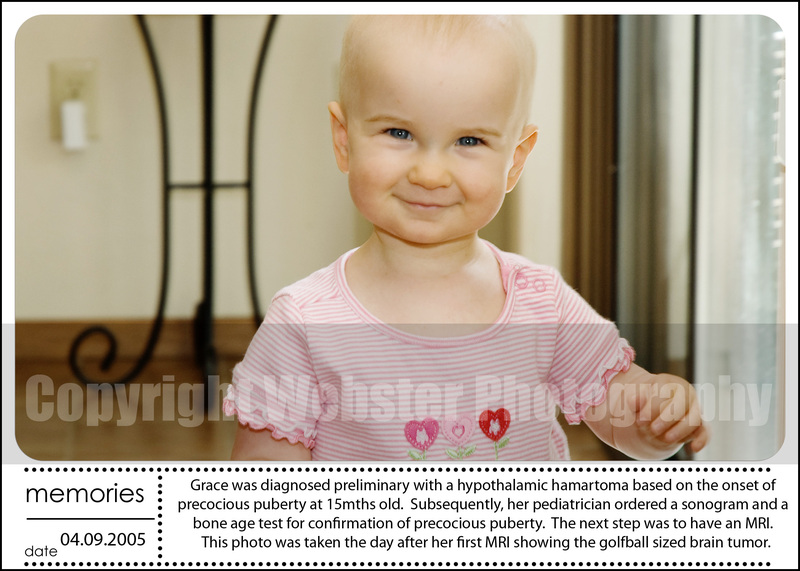 Grace had epilepsy, precocious puberty, rages, and suffered from depression and anxiety due to the hypothalamic hamartoma. 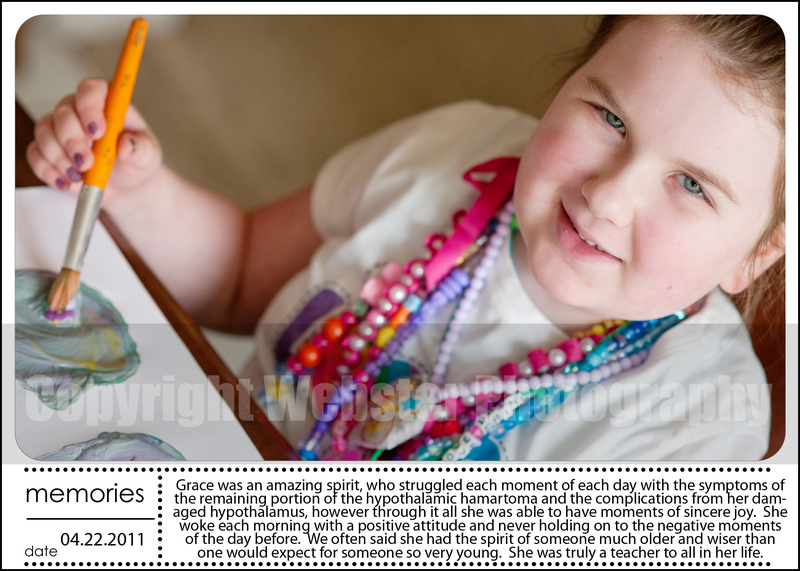 Grace had diabetes insipidus, lack of temperature regulation, hypothalamic obesity, and acquired Prader-Willi syndrome due to her damaged hypothalamus. Grace was a strong spirit, but unfortunately the body she lived with was fragile. Grace’s medical state was complex and it was not uncommon for her to puzzle the doctors who treated her and the ER doctors were no exception. They were overwhelmed by the way her body was shutting down and believed due to lack of oxygen at some point in the events of that morning, she suffered severe brain trauma and it was the catalyst for her hypothalamus to stop working completely. Our sweet angel had struggled her entire life and on this day she returned to Heaven. We find comfort in knowing she’s no longer living with daily seizures, rages, pain, and all the other daily struggles she was inflicted with as a result of her hypothalamic tumor. She’s free from all of it. 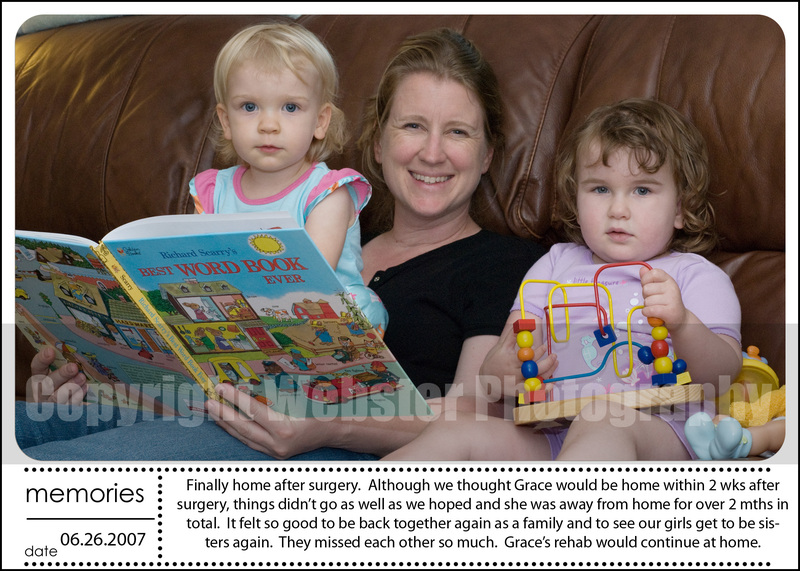 Over the years, Perry and I had talked about Grace’s 2007 surgery. It didn’t come without a price. A price Grace suffered with everyday. She lived with more medical conditions, medications and struggles then before surgery. We know too that without that surgery Grace would have continued to have more seizures, more rages and be taken away from us both emotionally and cognitively. The surgery saved Grace. The surgery allowed us to keep our Grace on this earth a bit longer. It provided Grace the opportunity to have more true, sincere moments of joy and happiness than many individuals experience in a life time. It provided Grace the opportunity to teach her family the importance of embracing today, finding happiness in today and loving those around you today. Grace lived in the moment. She found happiness in the simple routine of her day. She wanted no more that to be at home with her family telling us ‘I love you’ each time we left her sight. So, do we regret her 2007 surgery? No, we never have or ever will regret the surgery which gave us 4.5 years longer with our Grace. Those are 4.5 years of memories we will forever cherish. We will continue to invest our time and effort on the nonprofit, Hope For Hypothalamic Hamartomas (www.hopeforhh.org), we helped found. Our hope is that someday the work we do here will bring about a cure to this condition. 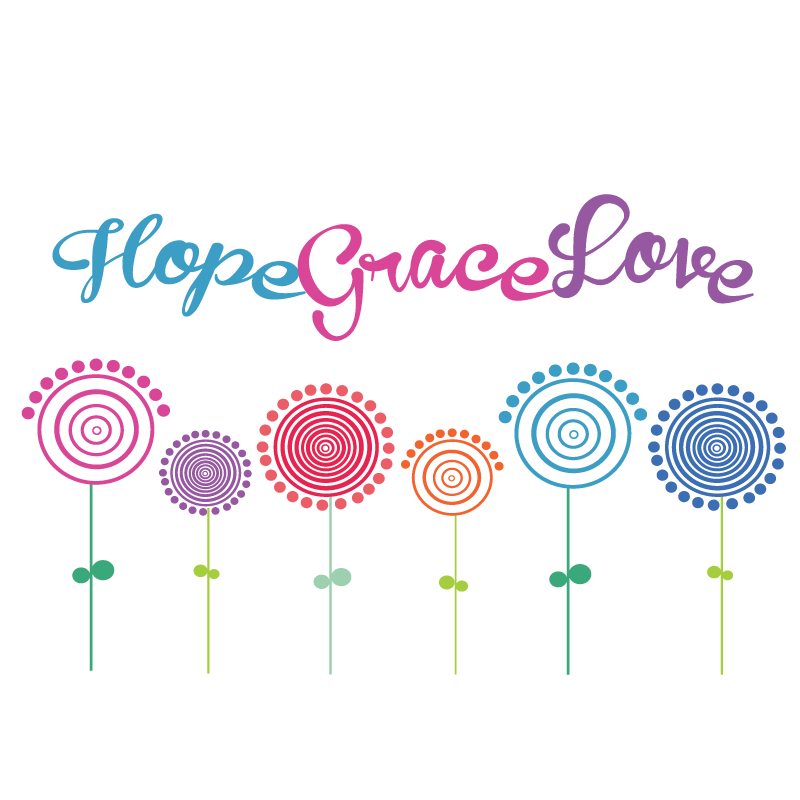 People continue to ask what they can do to help and at this time we ask only you to help us spread awareness of Grace’s condition with other friends, family and any doctors you interact with. Ask them to check out the website, ask them to donate to our cause, ask them to be aware of the risks of death as a result of epilepsy and a fragile hypothalamus. We continue to feel blessed by the days of laughter and joy we experienced together with Grace and hold each one of them close to our hearts. From the words of our sweet Grace, ‘Have a good day’. We know she wanted that for all us while she was here and now she is wanting the same as she watches us from Heaven.